Downtown Galveston is More Than Just Shopping; It’s Fun! Saengerfest Park in downtown Galveston at 2302 Strand is a great meeting place for Galveston residents and visitors. George Mitchell and Mitchell Historic Properties developed the small urban park as the centerpiece of its downtown holdings and, while privately owned, the park is open to the public daily, year round. The park is known for its giant chess set, London-style phone booth and a large compass on one corner. 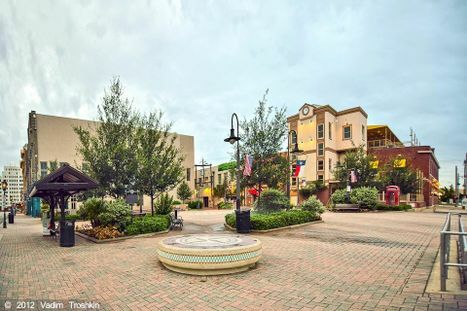 With a central location in the heart of the Strand National Historic Landmark District, Saengerfest Park offers annual free events to the public and easy access to downtown shopping. October at Saengerfest Park offers fun, free movies and music to the Strand. On Saturday, October 6, Movie Nite on the Strand will feature Alfred Hitchcock’s “Rear Window” starting Grace Kelly and James Stewart. Visitors are encouraged to purchase dinner to go at one of the diverse downtown restaurants. Movie goers should plan to bring chairs, blankets and pillows to enjoy the show under the stars. The movie will begin at dusk, weather permitting. On the second and fourth Saturdays of the month beginning at 6 p.m., visitors to Saengerfest Park can enjoy live music during Music Night on The Strand. Saturday, October 13, Music Nite on The Strand will host its first ever Zombie Dance Party with Flash the Robot DJ. The party will feature fire jugglers, zombie makeup artists, and more beginning at 6 p.m. and ending at 10 p.m. Zombie costumes are encouraged. Mitchell Historic Properties offers visitors and opportunity to shake a leg on a complimentary dance floor and a limited number of tables and chairs. Visitors are encouraged to bring their own seating and, of course, wear their dancing shoes! On the third Saturday of every month, Saengerfest is home to Market on The Strand. Starting at 10 a.m. and ending at 4 p.m., Market on The Strand is a festive monthly outdoor event where local artisans, handcrafters and growers can showcase their creations from March-June and September-December. Saengerfest Park will be host to the 2nd Annual Saengerfest Mini Monster Bash on October 27 from 1 p.m. to 4 p.m. This free, family friendly Halloween carnival will feature a costume contest for children ages 0-11, trick-or-treating at participating downtown businesses, and numerous family crafts and activities to celebrate the spooky season. Children participating in the costume contest will compete for cutest, scariest and most creative costumes for ages 0-2; 3-5; 6-8 and 9-11. During the holiday season, Saengerfest Park is home to a number of activities including Santa on The Strand and a new display of “Lasers, Lights and Magic at the Park”. Starting Saturday, November 24, Santa Claus will make special appearances from 1 p.m. to 5 p.m. on non-festival weekends during holiday season, welcoming children to visit and take pictures with him. The park will come alive with lights and magic hourly beginning November 24 during “Lasers, Lights and Magic at the Park,” a part of the Galveston CVB Passport to Holiday Magic. The show will feature a 15-minute laser light performance at the park hourly at 6 p.m., 7 p.m. and 8 p.m. The park will also feature a bit of holiday magic with text-for-snow machines located throughout the facility. Saengerfest Park offers Galveston visitors free, fun, family activities throughout the year.